"After Finishing the Lessons...A Beginning"
As a human I have spent my share of anger. As a Tai Chi instructor I have also seen my fair share of anger “coming and going” as the saying goes. There is a baseball adage wherein one figuratively acts as “pitcher” and “catcher” at the same time, thus my own saying “As a teacher, I see anger coming and going”. My student and fellow teacher Mike F. tells me that as a professional musician he swims in a sea of perpetual criticism. Such criticism he says comes from his fellow musicians as well as orchestra leaders and conductors. Yet, he states that he does not lash out at the conductor or his colleagues. I recall an incident in 2004 which happened right after meeting my present teacher, Master Stephen Hwa. I was in the throes of patting myself on the back because I had learned the Classical Tai Chi form with quite a bit of ease. What I failed to perceive is “that I was moving a certain way, but in fact I was not moving that way” at all. After all, I thought, I had finished the lessons from the Classical Tai Chi video series. Master Hwa wrote that when he observed me trying to internalize my movement away from the arm and shoulder, my movements initiated from the chest area. He stated that I would scrunch my chest to start an upper body movement. I recall being admonished quite vehemently by him on this “scrunching”. The critique came during one of my private classes with him at a local park in Rochester, NY in the Summer of 2004. I admit being surprised by the vehemence of his correction but did not feel angry. In October of 2004 I recall reading the Classical Tai Chi Forum 10 which was called : “After Finishing the Lessons, A Beginning”. There I came across a complete written account of the critique. First I read “You need to remember, sometimes the appearance of reality is actually an illusion”. This was followed by an admonition to use “ a fresh eye to review the lesson video which can uncover any misinterpretation of movements”. Then I read a synopsis of my meeting with Master Hwa and my “scrunching” when I thought I was moving correctly. Where I did not feel “angry” upon receiving admonition in person, I did feel angry when reading the admonition in writing. My thought was: “How could my teacher put my mistake in writing for all the world to see”? I initially felt sullen and angry because I felt my teacher was being condescending and insulting and I felt shocked by what I read. After all, I thought (even though he did not use my name but simply said “one student”) who else could it be but me, me, me. Insert the melody and additional lyrics for: "You are so vain, you probably think this song is about you" here. After stewing on this for some time, I began to reflect more calmly. During the “hottest” moments of that incident however, I refrained from making any angry retorts to my teacher. As I “cooled” down however, I began to realize that I had been proud and arrogant thus thinking more highly of myself than I ought to. Upon further reflection my initial angry thought was “I have studied Tai Chi before this for a long time, I am a good student, how can he say this to me”?. After further consideration however, I realized that it was I who had contacted Master Hwa and asked him to teach me, not the other way around. If I wanted him to teach me why was I not being humble and gracious about what he had said or wrote about “me”? After further reflection, I realized that he had provided a great talking point and lesson for a hundred other students who could benefit from my mistake. I realized I was being “Egotistical” and perhaps one might well ask what is egotism, what does it have to do with learning Tai Chi or you for that matter? “The Prime Minister of the Tang Dynasty was a national hero for his success as both a statesman and military leader. But despite his fame, power, and wealth, he considered himself a humble and devout Buddhist. Often he visited his favorite Zen master to study under him, and they seemed to get along very well. The fact that he was Prime Minister apparently had no effect on their relationship, which seemed to be simply one of a revered master and respectful student. "I have become impatient with the slowness of the learning curve regarding Classical Tai Chi for this reason alone: the forms playing does not seem to be leading to martial application, and there does not seem to be any partners out this way who know Classical Tai that I can practice. So, I am enrolling in a Wing Chun class through a park district close to where I live. My first class was this past Wednesday, and I asked for an opportunity to use what I have learned in the Forms playing with the Sifu that is teaching the class. Here is the scenario. He asked me to use a boxing jab to try to attack him. He became aggressive immediately by using a barrage of strikes, blocks, and forward motion. I used circular defensive arm moves while playing Repulse Monkey. I could feel my internal energy in my Dan Tien and quarter body moves. However, Sifu was able to tag me in the face. In blocking his punches, I received a large bruise on the top of my left hand. We did not have padded gloves. OK, so here is the question. How did he get inside me so quickly? It was all a blur. Now, given I was not as aggressive as I could have been. I did pull back. But still, he got close to me very quickly, and stuck to me. It was like I was pulling him round trying to free up some space between us. He had the advantage. He was fighting on the inside before I could do anything effective." When I used Fair Lady Works the Shuttle as he squared off with me, my ward off was good using the turning of the waist and arms connected to the upper body while lower body stayed rooted. But he grabbed my T-Shirt as he went in the other direction and used the power I used to move away from him after the ward off as a way of sticking to me. He could have hit me in the temple, or in the back of the head. But it was a demonstration I had asked for and so he did not. I did knock him off balance because he was double waited at the time. That felt good. In another demonstration, Sifu wanted to prove a point that he could finger jab me in the sternum before I could do anything about it. He was lightening fast. I was not fast enough to block his incoming force. Probably because my reflexes are not as highly developed as his. Thinking back, I could have turned my upper body quadrant away from his incoming force, but didn't because he wanted to square of with him. I simply followed instructions. Here is where you come in Master Hwa. I need your concerted effort in analyzing what happened. I know that you where not there and did not have an opportunity to observe my form and delivery. But you have observed my playing the Forms both in Florida and Buffalo. you also have your own experience and wisdom in how you might have handle these situations. Don't pull any punches :) The above could be a good subject matter in one of your Forums e.g. how is it that we are employing martial application along with our Form playing. By the way, how does it take to be a Tai Chi fighter? Have you had sparring experience? Hi James: There is no mystery to be good at martial art application. This is discussed in my book and video. As I recall when you visited me in Florida, you were not close to master step 1. You were able to use internal at several moves but not all angles. From your description of your sparing experience, you still need to think when you move. No wonder you were always one step behind, and being controlled by the opponent. Step 3 needs partner to practice. There is no short cut to that. I studied at Wu's Tai Chi Academy in Toronto for some time, then I met Stephen Hwa and my Tai Chi got better. I was doing Tae Kwon Do at the time at Wu's and my skills were not great, nor were my Tai Chi fighting skills in the studio. On the street however, I was able to defend myself quite adequately as I had the misfortune of being attacked/mugged on several occasions. I found in Tae Kwon Do some different experiences than I found at Wu's. For instance, with Tai Chi I found myself in situations where I ended up grappling but in Tae Kwon Do I did not. Why not get some Wing Chun people to spar against you while you do Tai Chi, why "throw out the baby with the bath water"? In Tai Chi one does not use "boxing jab to attack him", it is a pure defensive art, why not an agreeable "sparring" situation, where he uses a boxing jab to attack you? Anyway, all this proves is he is better at Wing Chun than you are at Tai Chi, not Wing Chun is better than Tai Chi. I don't wish to analyze your synopsis any more because it reads the same throughout. If one wants to get better at Tai Chi, it requires sensitivity to opponents movement, ability to ting jin, stick to opponent and to have intelligence under pressure. I see no reason why any of that cannot be maintained into old age. Even Western Boxing's clinch (before it became the disgraceful stalling tactic it is now) could be said to have once relied on some semblance of sensitivity. Even with that the bout between Mike Tyson and Larry Holmes went to grappling and trapping range 10 times in the first three minutes...once every 18 seconds. This means "practicing push hands and sparring to develop sensitivity and finesse" with a variety of opponents. How can anyone expect to develop sticking from just practicing the form? I see no place where Master Hwa promises a "flowering" of self defense ability. Additionally, no one ever promised folks "Pie in the Sky" in Classical Tai Chi and on the contrary the limitations of what we do have been spelled out even more than I got at Wu's. Learning to stick to opponent in close quarters This step requires willing and trusted partner and ones own willing participation. How to learn to spar with Tai Chi, particularly if one can find a Wing Chun partner , particularly one who is physically stronger then they will find the guy will just ram down your centerline and smash you out of the way...like what you describe. Then you have to stick with his smashing, not run away. As one gets older, they are no longer going to be the fastest or strongest so they have to rely on feeling out the opponent. If one can't beat with speed then you have to stick. This does not mean you are not going to get hit. In his fight with a Hard Style opponent, Wu Gong Yi was limited by rules not to stick, if he could then I think things would be much different and perhaps not "called a draw". If one is moving from Tai Chi to Wing Chun having some idea of the difference between Wing Chun and Tai Chi comes with research before starting. My student Anh Le does Wing Chun and also spars with people who do mixed Martial Arts. He also admits there are things that he personally can do and cannot do and although he is defeated, he does not blame either Tai Chi or Wing Chun, he has enough reasoning ability to put the onus squarely on his own shoulders. He states that Chi Sao in Wing Chun is done with arms that move independently of the torso in straight line fashion and yin yang junctions are at the shoulder in contrast to that of Tai Chi. It is interesting that chi sao in Wing Chun which to the uninitiated "looks" like Tai Chi push hands emphasizes economy of movement and decrease in circular action by centering the elbow in straight line arm movements. On the contrary, we see centering of elbow in tight compact form with a subsequent increase in circular action. If one does not posess number 1 where internal power can be delivered at any angle, much less from one's own center how on earth can one expect to attack an opponent when one cannot even protect oneself by sticking, which comes from push hands which have never even done? You wish me to be honest, not pull punches, I would say get a "grip", so to speak. How can one with reasoning that Tai Chi is not good enough, also expect to reconcile the attitude "I'm here to learn to kick him in the *&%$" that I heard at the workshop. How does that reconcile with "He who knows much is learned; he who knows himself is wise. He who rules others has the power of muscles; he who rules himself has strength?" Once again, who is attacking you? Do you get mugged just walking out the door, simplest martial art would be the art of "getting out of Dodge"...move your belongings to another section of town, I see no one else but you, where are the muggers? Wishful thinking and an "I wannabe" attitude , to learn to "kill 10 people at one fell swoop" from any martial art...ain't going to happen. If 10 guys jump you, then hope they have mercy. What do you think about my adding a Wing Chung Traditional Wooden Dummy along with my learning the 108 Classical Tai Chi Forms? What do you think my about adding a Free Standing Makiwara Board to my regimen? The impetus for my questions has to do with my desire to move into martial application. I do not know that mastering the Forms is going to be enough for me at this point. I liked what I observed at the training in Buffalo last summer between you and a student regarding "Carrying the Tiger to the Mountain." I have been practicing Classical Tai Chi for 7 plus years, and am on the 98th Form, and anticipate finishing sometime in 2012. I feel alive, and competent when practicing Wudang Tiger Tail Short Staff, and powerful when palm striking and kicking a 4 x 4 free standing piece of wood outdoors. I have an appreciation for my adequate self defense skills in what I have learned in all these disciplines. How do you figure a striking post will help? If one cannot muster internal power for application, isn't this a weakness that is a priori to any "striking post"? Want to get better? Then develop internal power for application. Other than that you are relegated to using external force which gives you no advantage over a more accomplished external martial artist, as you clearly illustrated. Master Hwa tells me even some retired old ladies that he teaches seem to enjoy using their newly acquired semi-internal power to push people around. To paraphrase Master Hwa's statement about "winning moves": "There are no winning martial arts, only winning execution of martial arts" , in other words it is the size of the fight in the dog, not the dog that is in the fight. 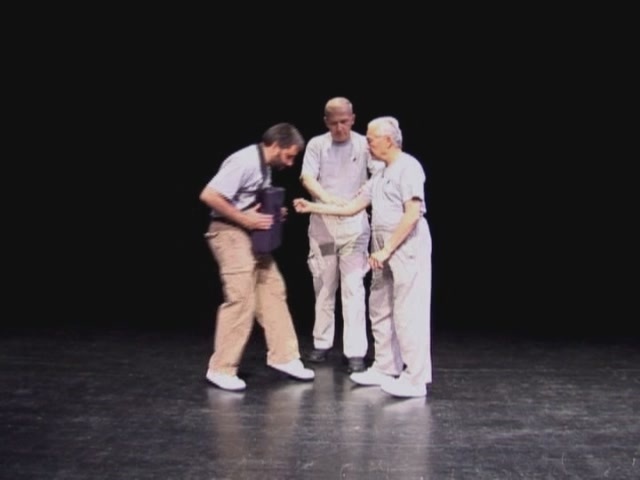 Knock yourself over with your own "holding pattern"
From the web page of Master Stephen Hwa in 2005 and updated in 2012 for this Blog: "I am pleased to announce and congratulate the first certified teacher of Classical Tai Chi is Jim Roach of Buffalo, NY. He is extremely dedicated and accomplished. Jim has another background in such diverse external styles as Karate and Tae Kwon Do but Jim began his Tai Chi study in 1976. He subsequently studied Yang and Wu's Style of Tai Chi, even while he was studying Tae Kwon Do in Buffalo. He spent much of his time traveling back and forth to Toronto Canada over the years at least once a week, sometimes more to study with very notable teachers. Jim had the privilege to study with and become a disciple of the Great-grandson of legendary Grandmaster Wu Chien Chuan, Master Wu Kwong Yu. Jim became actively engaged in study with Master Hwa in April of 2003. 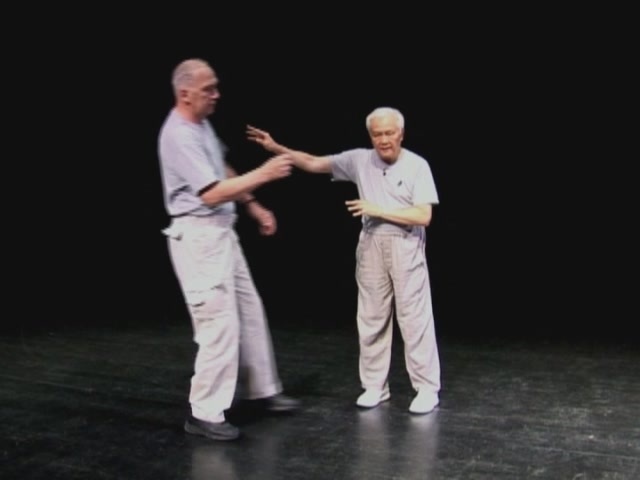 Since that time, Jim has engaged in numerous private instruction classes with Master Hwa as well as group classes. He also assisted and participated in many of the scenes of the DVD "Tao of Martial Applications". In addition, he appears in several photographs of the book "Uncovering the Treasure". 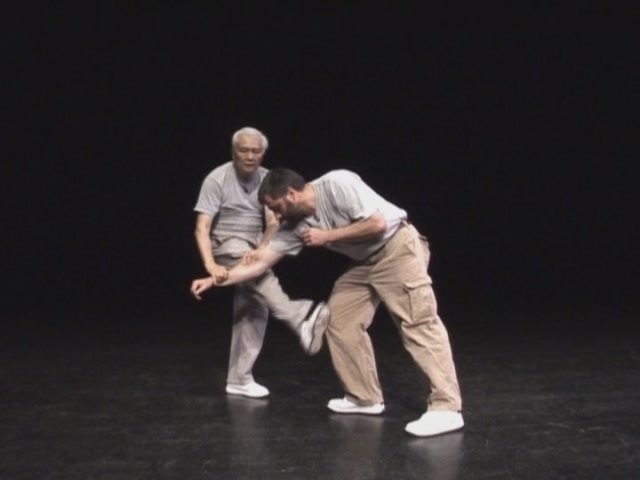 After only a short time, Jim was (to paraphrase Master Hwa ) "fascinated with the underlying principles that unified Classical Tai Chi’s seemingly complex movements." Once in awhile I have taught Tai Chi to students that have previously studied Tai Chi, Karate, Kung Fu, etc. I have students now that have studied both Tai Chi and "hard" styles as well. One of those students is still involved with studying Wing Chun along with his study of Classical Tai Chi. I recall teaching someone who owned his own Karate Studio and who had become a martial arts legend of sorts. He saw me practicing the Wu's Sword Form and asked to learn it. I said I would teach it if he would learn the Wu's style 108 long from from me. He appeared in the “Inside Kung Fu” magazine because of his prowess in several other martial arts and was versed in many weapons forms. Grandmaster Young Wabu who Master Hwa states was versed in many martial arts as well as being a master of Pekkwar Monkey boxing when he met Wu Chien Chuan. The Karate teacher unfortunately did not stick with Tai Chi as did Grandmaster Young with Wu Chien Chuan or learn the sword, as he stated he was “bored” learning the long form. I noticed when I taught the Karate teacher however that he constantly had his shoulders in a "holding pattern" of being hunched forward and held very tightly. I also noticed it was very difficult for him to "release" the holding pattern to drop the shoulders, in fact I never saw him able to do it at all. This gave his back a constant hunched appearance, causing the chin to jut out. The hunching and tightening seemed to extend to the lower torso where he was unable to loosen the buttocks to straighten the back and thus free the waist to turn freely. "I am coming from a karate background. For me it (classical tai chi ) is like learning karate all over again. Learning how to walk, turn, block and strike. The 'square form' is much easier for me to follow. It is more familiar to me. Coming from a 'hard' style, I find it hard to relax as I do the form. It is ingrained to tense as the blocks or strikes are applied. I can find many practical martial moves in the form. Understand that in karate katas not every move is explained as to application unless you ask the instructor, 'how is this used'? All blocks are also strikes, and all strikes are also blocks. To me it seems Tai Chi is a form of martial arts Qi Gong. This is great as my body can no longer tolerate a 'hard' style. I have a suspicion however that tensed up body parts are not strictly the domain of Karate practitioners. I see them over and over again in students who do not study other martial arts. I find many, many students who state they only want Tai Chi for "health". Yet, many of these practitioners are so tense, it looks like their extremities are literally tied into holding patterns. Although, I think in the case of karate there are a number of them with such repetitive movement in Katas where it eventually becomes what is called a “holding pattern”. In other words their arms, shoulders, backs, chests, etc. get more or less locked into a detrimental position. I speak not as just a Tai Chi practitioner but as a former Karate and Tae Kwon Do practitioner with an advanced belt. Master Hwa has talked about how the practitioner needs to not “tense up” during push hands training. I vividly remember my own push hands training with Yang Style then later at the Wu’s Academy in Toronto. I was always urged to “sitback” in order to loosen my back and waist, with danger of “getting pushed” ever present. I was told over and over to "relax", "relax", "you have got to relax or you will get pushed". At Wu’s Academy this often consisted of a free style where one would end up on the floor or bounced off a wall. This was not the “mean spirited” actions of my fellow student, it was my own body tension and they really only had to apply very little of a very gentle “push” in order to send me flying. Often I found myself on the floor or slammed against the wall because I was retreating with a tensed up body and tripped myself up…the other practitioner had not even pushed me. “Holding patterns?” In all the times I was “sent flying” I did not learn "why". Flailing one's extremities will do nothing for showing where one has excess muscular tension. It has only been through the study of the Classical Tai Chi Form and Internal Discipline that the fog has lifted. It is anathema to correct practice to use external movements while attempting an internal movement. It is anathema to correct practice to use extraneous movement while attempting internal movement. Extraneous movement, tensing a shoulder here, tensing an arm there, etc. occurs because one simply cannot sense it happening...and I eventually came to learn I had some extremity that was held tensed or even crooked. This extremity sent tension into the entire body and provided an easy target, as I proved over and over, ostensibly even knocking my own self to the ground with no one touching me…just my own fear and tension doing the job.